What was the A-side of the first single released by Apple Records? Stumped? Here are some hints. It turned out to be the band’s most successful single, selling nearly 6 million copies worldwide in 1968 alone. At the time, it was the longest song to ever top the British charts. 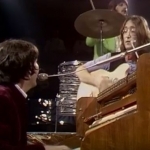 It was written and sung byPaul McCartney, but its inspiration also involved John Lennon.